Using a laptop does not mean you have to sacrifice computing power - at least if you are powered by the Intel Core 2 Duo T9600. This processor provides top-end notebook performance while drawing only 35 watts, allowing you to take on more demanding tasks without overtaxing your battery. Intel's Intelligent Power Capability is built into this chip, further enhancing your battery life by managing CPU power loads. The T9600 features a L2 cache of 6 MB and a 1066 MHz front side bus, giving your laptop plenty of speed and making sure it keeps up with you when gaming or editing. You will also get more out of your entertainment experience due to the built-in Advanced Digital Media Boost feature, which provides high-end audio and video processing. Offering great performance without excessive battery drain, the T9600 helps you get the most out of your laptop. I upgraded a Lenovo T400 using T9550 (2.66GHz) and a SL510 shipping with a T3500 (2.1GHz) 800 MHz FSB with the T9600 and it works great in both machines. Impressive for the SL510 that got a very noticable improvement in performance and automatically changed the FSB to operate at 1GHz. There are even faster processors available like T9800 and X9100 but they are much pricier. Installed this myself after watching youtube videos. Got some Artic Silver 5 thermal paste and popped this new processor in. While it improved my Windows Experience Score from a 5.2 to 6.4 for processor and memory, it didn't seem to make a huge difference in overall performance when surfing the web. I recommend it and a SSD drive to bring the Dell 1545 back to life. The SSD probably makes the biggest difference. I certainly don't regret installing this processor, as I know it is faster, and it was fun and easy to install. 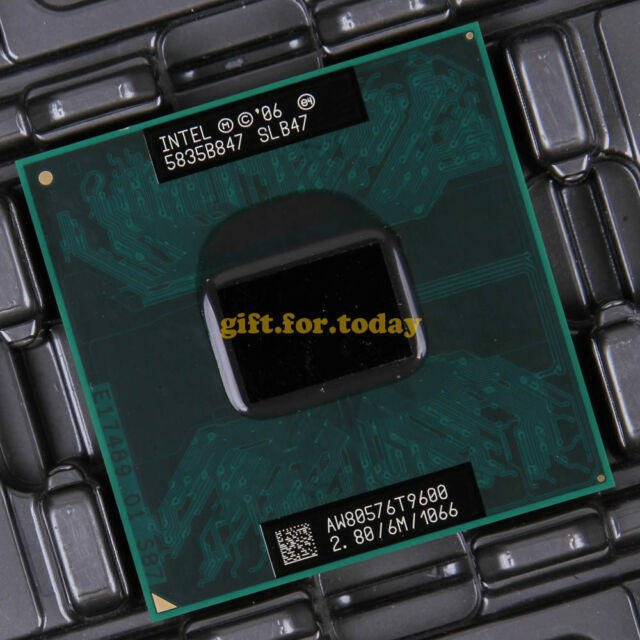 First, before you buy this CPU make sure it fits your laptop CPU socket(Socket P 478-pins). You can download CPU-Z to check that out(it will show it under "Package"). Also, that you or a friend knows how to install it(main problem is to open the laptop). Don't think on going to Best Buy, Office Depot, Circuit City, etc. because I'm pretty sure they don't do upgrades to laptops CPU, and if they do you gonna have to pay over the hundreds. So if you have all this set you are ready to get this best CPU. Oh I forgot you also need thermal paste. I recommend you use this one "Arctic Silver 5" which you can get on Amazon for a really good price( around $4) and is one of the best. Hope this helps. Enjoy it !!! !